American Expedition Vehicles just threw down the gauntlet. The company known for outfitting Jeep Wranglers with assembly-line-quality aftermarket parts has unveiled this 2014 Ram 2500 concept for this year’s SEMA event. Starting with a 2014 Ram 2500 Crew Cab Diesel, AEV fitted 40-inch-tall tires under the Ram with a three-inch suspension lift. 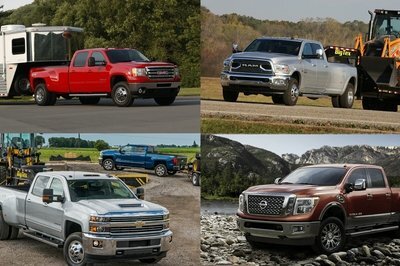 The result is a heavy-duty truck that’s still usable around town, but can handle any off-road challenge thrown its way. AEV made a name for itself by developing its aftermarket products with guidance from Chrysler engineers, ensuring top-notch quality. The tradition continues in the Ram project with such examples as the suspension setup. The front springs remain stock and sit atop cast-aluminum spacers, so as not to change the ride quality, while heavy-duty Bilstein shocks help manage the expected abuses found off-road. 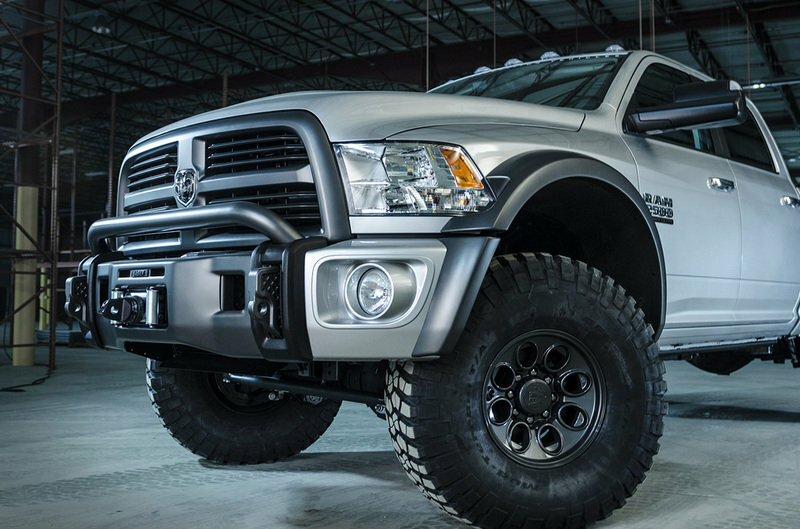 The Ram’s front bumper is 3/16-inch-thick stamped steel — over four times thicker than the stock unit — and hides a massive 16,500-pound Warn winch. Two recovery points predominantly protrude out front, ready for D-ring shackles. The bumper is divided into three separate pieces for easy replacement of damaged parts, or even further user-customization. Around to the Ram’s side are the AEV high-clearance finders with integrated flares. 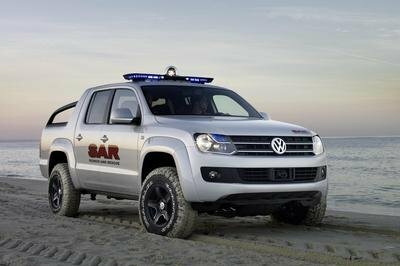 They provide the capability to run 40-inch-tall tires with such a minimal lift. (Normally 40-inch tires require six to eight inches of lift) Unique 17x10, AVE-designed “Katla” cast-aluminum wheels are ruggedly stylish and can carry 3,650 pounds each. In addition to the suspension setup, AEV added a high-steer kit that corrects for the steering gear’s new geometry, while only two inches of lift were added to the rear axle, making the truck level. While the truck as a whole isn’t headed for production, the individual AEV parts are. They go on sale sometime in 2014. Three inches of lift up front and two inches out back give the AEV Ram a level stance, while high-clearance fenders fit 40-inch-tall BFGoodrich Mud Terrain KM/2 tires on 17-inch custom wheels. 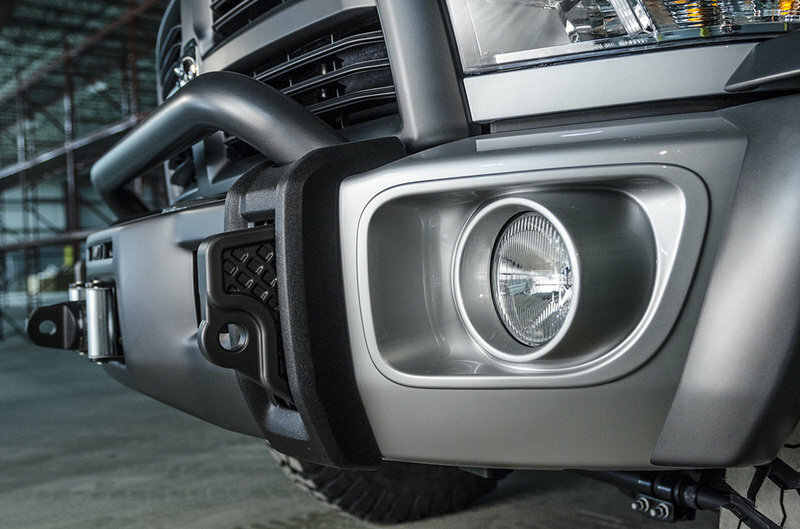 The 3/16-inch-thick, stamped steel, modular front bumper can accommodate a 12,000 to 16,500-pound winch within its 5 o’ clock shadow grey center section. Being made of three separate pieces, buyers can customize the look of their truck or easily replace damaged sections at much lower costs. 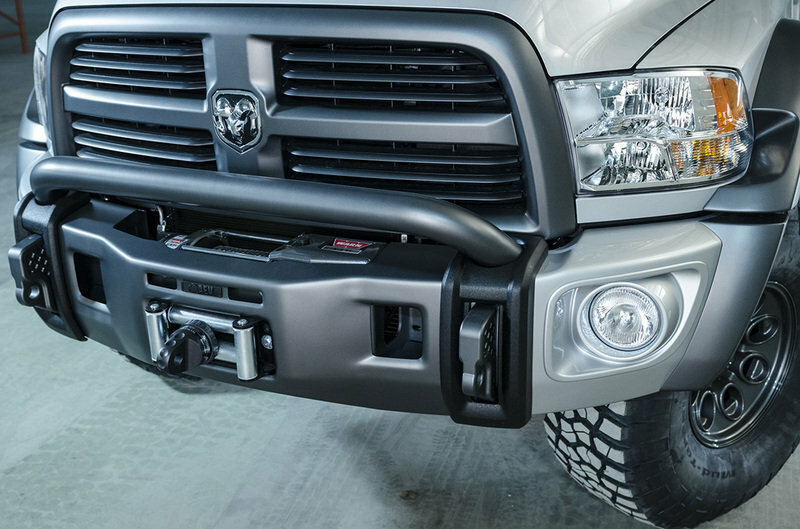 Flanking either side of the winch are 6.5-inch off-road lights and stout recovery points. 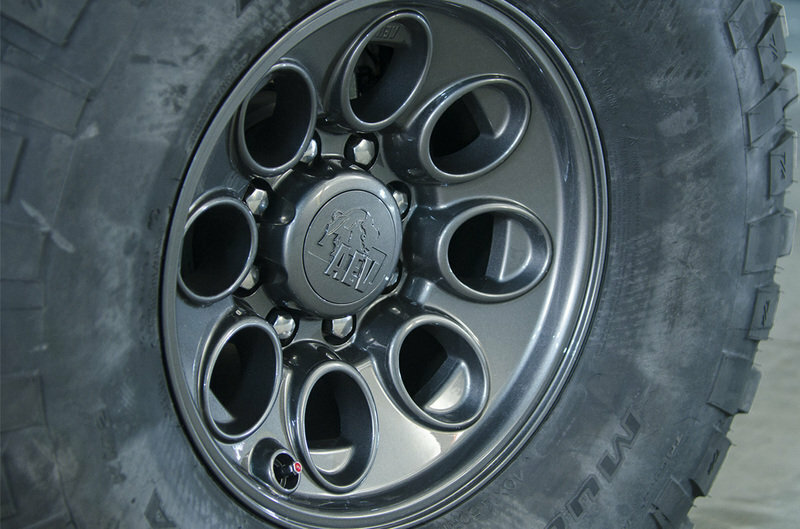 The “Katla” 17-by-10-inch rims drip with classic AEV style. A cast-aluminum center cap and recessed valve stems finish off the look. 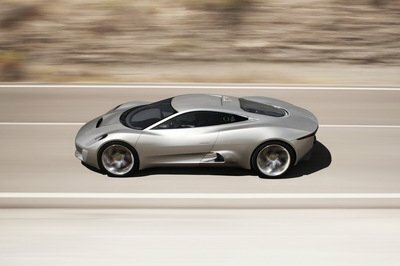 The stock rear bumper remains, but we suspect that won’t last for long as the company will likely develop its own. 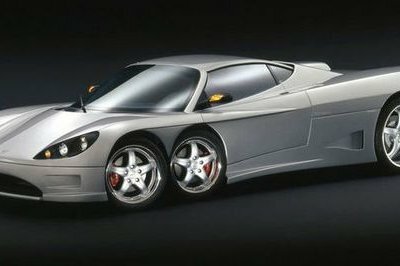 The concept: Since 1997, American Expedition Vehicles has been on the cutting edge of the 4WD industry, constantly pushing the boundaries of design and innovation. AEV recognized that there is a void in the industry for customers who require a vehicle that is very capable off-road, has exceptional handling characteristics and ride quality but also has a large cargo capacity and is able to satisfy the demands of a heavy towing. AEV felt that the Ram was the ideal vehicle platform to fill this void. The AEV Ram Concept is gear toward the outdoorsman-someone who requires a capable vehicle off-road, but still requires the larger size, higher towing capacity and increased payload of a ¾ or 1-ton pickup truck. AEV set out to achieve these goals by breaking the mold of the traditional "lifted truck" methodology and utilized their engineering and design expertise to create a complete vehicle package that includes components that are designed to work in harmony with each other in both style and functionality. The result is a great looking truck with high ground clearance, a low center of gravity and superior front end protection. • Provides additional clearance for larger tires with less lift-accommodates a 40" tire with only 3 inches of lift. • Fender Flare design integrates with and compliments the AEV Premium Front Bumper for an aggressive yet refined appearance.